LOL That is a fabulous picture! Absolutely a 1,000 word picture! This is awesome! Sometimes we think our Rufus is a cat because of his mannerisms and cat-like agility…glad to see he is in good company! Could we hire Shiva to teach Honey how to walk up and down a steep companionship in a boat? How did she get up there? What an adventurer! Love it! Did she actually make it to the top? Perhaps Shiva the Genuis has found a new agility obstacle. What a GREAT pic – such a cute but naughty face! Ha! That’s great! Can’t help but wonder how the cat feels about this. My only question is…did she make it to the top?? BOL!! Great picture! Hahaha, I love it! How did the cat react? Ha, and territorial plays? She was practicing her agility 🙂 What a cutie!! That is great! I wonder how this pup got down! Shiva is a particularly special pup, though! BOL! Oh Shiva! Just what did the kitty think about that cat tower stealing business? Miss Shiva, how did you get up there? I had to tweet this one because it was so fantastic! Awesome Wordless Wednesday pic! This is a great picture. 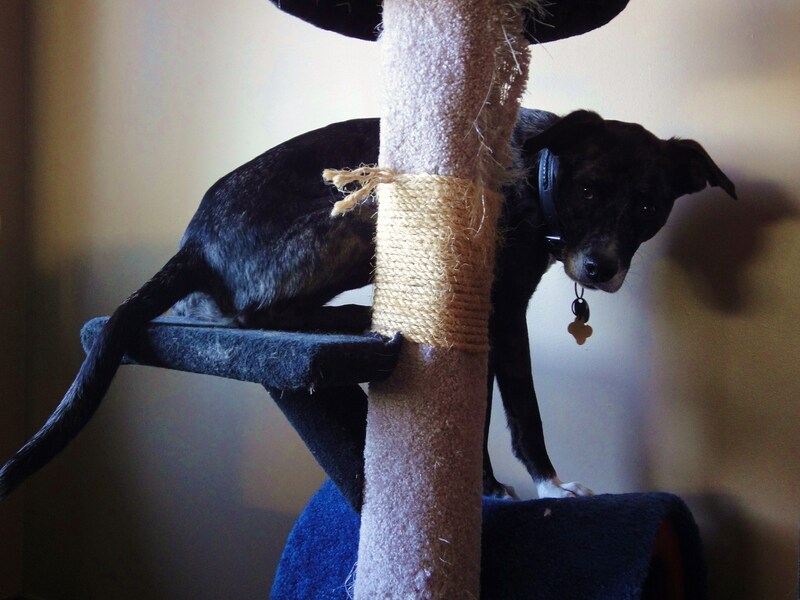 The crazy thing it that I have a photo of Phoebe on our living room cat tree with two of the cats and I was going to post it for WW yesterday but didn’t ever get around to posting anything. Too bad, that would’ve been pretty funny. Hmm, my comment didn’t arrive, am I spam, lol? I said something along the lines of that being a humungous cat tower:) It looks perfect for Shiva to play on too!